There's an interesting article in Sunday's New York Times about how we arrive at collective judgements of cultural products. The common-sense view, however, makes a big assumption: that when people make decisions about what they like, they do so independently of one another. But people almost never make decisions independently — in part because the world abounds with so many choices that we have little hope of ever finding what we want on our own; in part because we are never really sure what we want anyway; and in part because what we often want is not so much to experience the "best" of everything as it is to experience the same things as other people and thereby also experience the benefits of sharing. 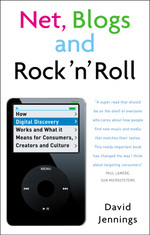 It's written by Duncan Watts, one of the Columbia University professors whose research on an artificial market for unsigned bands I draw on at some length in the Wise and Foolish Crowds chapter of the book. Blogging is clearly one of the major trends in music, media and entertainment. It makes complete sense for the major labels to use the process in a creative way to encourage, discover and communicate with new artists. This is according to Sony BMG UK chief executive Ged Doherty, quoted in Digital Music News, who, according to The Register, will frown on any senior staff at Columbia Records and RCA Records who don't blog. This is tied into an initiative to replace the old process of bands sending in demo tapes, and aspiring artists are also expected to blog about themselves when they submit material. This is all very much in keeping with the old Cluetrain manifesto arguments: instead of "markets are conversations", the premise of this approach is that "discovery and A&R are conversations". SonyBMG is working with Vox on establishing their blogging platform, and Doherty has his own blog there (which, in my experience, wasn't that easy to find with Google).